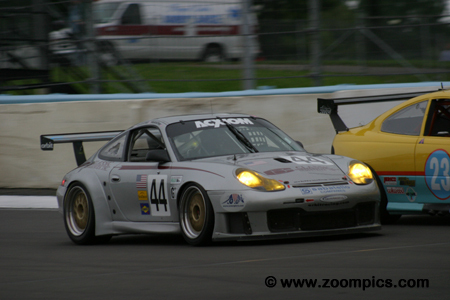 The Grand American championship returned to Watkins Glen for a second visit in August. 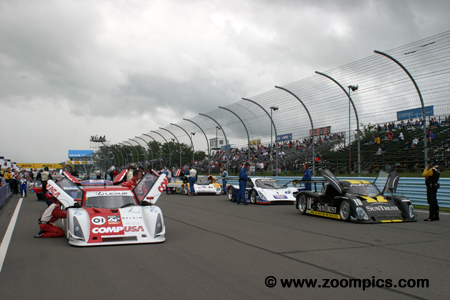 This time teams would compete in the Sahlen’s 200 on the seven-turn 2.45-mile ‘short course’. This race was a support event for round twenty-two of the NASCAR Nextel Cup series. Practice and qualifying were scheduled for Thursday but heavy rain forced the cancellation of qualifying. The rain returned during Friday evening’s race. With 36 of the 72-laps completed, many competitors were caught off-guard by the wet conditions. Several cars spun in the last turn – five of these vehicles suffered severe damage and retired from the race. With rain washing out the Thursday’s qualifying session the grid was set by team points. The No. 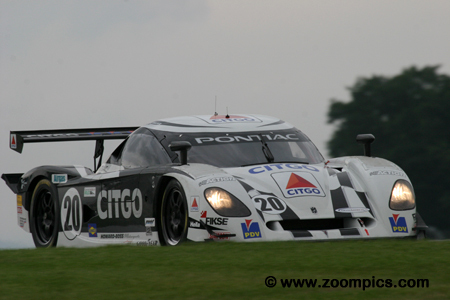 01 Ganassi Racing Riley MK XI that won the previous round at Mid-Ohio and the six-hour race at Watkins Glen in June started on the pole. 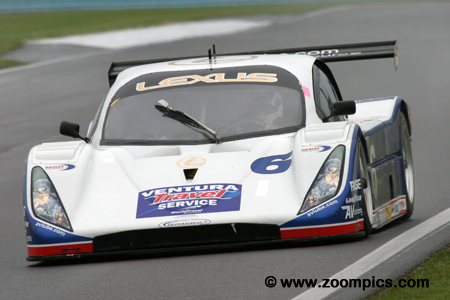 Driving the opening stint was Max Papis and he would be replaced by his co-driver Scott Pruett. Pruett was a busy man as he would be competing in the NASCAR event Sunday. Didier Theys performs a perfect pirouette when entering the pit lane. Sharing the No. 27 Toyota-powered Doran JE4 with Theys was Jan Magnussen. The car started from the fifth position on the grid. The team gambled believing that when the rain stopped, it would not return. They changed to dry tires and their decision paid off. Their victory ended a five-race winning streak for the Riley chassis. 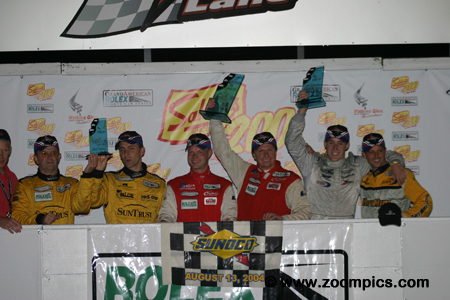 In the center are the Daytona Prototype class winners of the Sahlen’s 200 at Watkins Glen – Didier Theys and Jan Magnussen. To their left, are the second-place finishers from Michael Shank Racing – Oswaldo Negri, Jr. and Burt Frisselle. Taking the final position on the podium are SunTrust Racing’s Max Angelelli and Wayne Taylor. The No. 37 Turbo Performance Center Porsche GT3 Cup started in the twenty-eighth grid position – fifth in the Super Grand Sport class. The car was shared by Spencer Pumpelly and John Littlechild. The pair survived the sudden downpour on lap thirty-six and finished sixteenth overall and scored their first class victory of the season. In round six at Daytona, team owner Tom Milner changed the Prototype Technology Group driver line-up. No longer was Boris Said paired with Bill Auberlen. He would drive with Joey Hand and Justin Marks would join Auberlen. The change ended the dominance of the No. 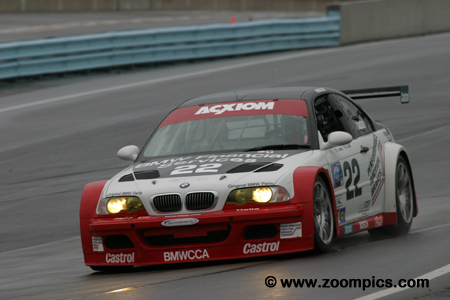 21 BMW M3 and the sister car scored its first victory of the season at the second Watkins Glen event. Super Grand Sport point leaders, Andy Lally and Marc Bunting had another great result. The pair drove the Turbo Performance Center Racing Porsche GT3 Cup and started first in class and twenty-fourth overall. At the checkered flag, they were second in the Super Grand Sport class - just over twenty-four seconds behind their teammates. The Super Grand Sport category podium. In the center are the class winners from the Turbo Performance Center Racing – Spencer Pumpelly and John Littlechild. To their left are second place finishers also from TPC Racing – Andy Lally and Marc Bunting. Rounding out the podium are the father and son team of Joe and Will Nonnamaker. 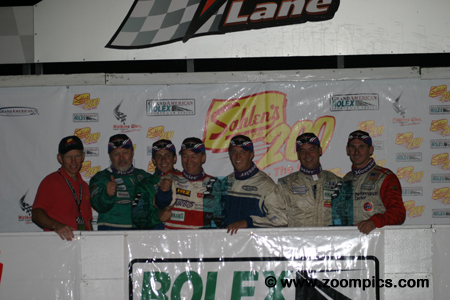 To the right of the Nonnamakers is the sponsor of the Sahlen’s 200 - Joe Sahlen. Posting their best results of the season was the No. 6 Doran JE4 entered by Michael Shank Racing. Co-drivers Burt Frisselle and Oswaldo Negri, Jr. started in the fourth grid position. The team ran in the top ten for much of the race and survived the sudden deluge. A bold choice to go with dry tires during the last pit-stop allowed Frisselle to move from seventh to second in the final ten minutes of the race. Starting on the outside of the front row were Max Angelelli and Wayne Taylor driving the No. 01 SunTrust Racing Riley MK IX. With the contest in its closing stages, a final caution provided an opportunity to stop for tires. The race leading SunTrust team, believing that it would rain again, stayed with the wet tires. On a drying track, they were passed by the No. 27 and No. 6 Dorans and finished third. 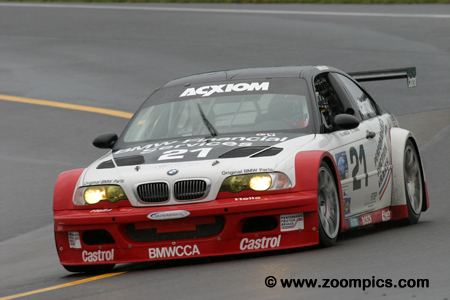 The two Prototype Technology Group BMW M3s started first and second in the Grand Touring category. The pair of BMWs ran in tandem, without the No. 22 experiencing the throttle problems that plagued the car in June’s six hour event. At the end of the race co-drivers – Bill Auberlen and Justin Marks were tenth overall and second in the Grand Tour category. Howard-Boss Motorsports entered a third Crawford DP03 for Andy Wallace and NASCAR driver Tony Stewart. At this was the team’s first event of the season they started fifteenth overall and last in the Daytona Prototype class. The first time Stewart drove the No. 20 Crawford was in the race. He was making good progress when he had a flat tire. At the checkered flag, they were eighth in class. The extra track time may have contributed to Stewart winning Sunday’s NASCAR event. The No. 43 Orison-Planet Earth Motorsports Porsche GT3 Cup was required to start at the back of the grid as the car had not accumulated any points during the 2004 season. Sharing the Porsche were the father and son team of Joe and Will Nonnamaker. The pair ran a consistent race and avoided the troubles experienced by their competitors and finished twentieth overall and third in the Super Grand Sport class. 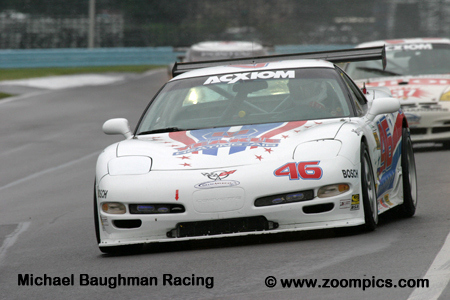 The Policastro’s and their co-driver Mike Fitzgerald had another great finish at Watkins Glen. 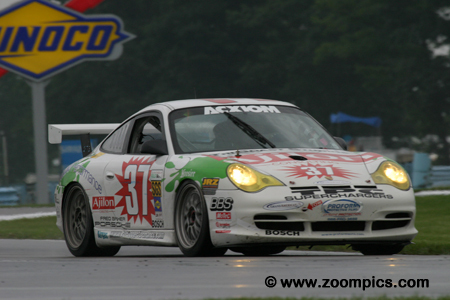 At the six hour event in June, the Orbit Racing team finished third in the Grand Touring category. Friday evening, they repeated their performance, capturing the final spot on the podium. This result was all the more satisfying as an accident in the previous round at Mid-Ohio forced them to retire from that race. 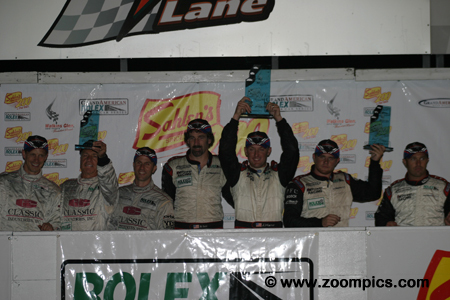 Again, it was the Prototype Technology Group drivers on the top step of the victory podium. The only difference, it was Boris Said and Joey Hand rather than Said and Bill Auberlen. Auberlen and his co-driver Justin Marks standing to the left of the winners finished second. Claiming the final spot on the podium are the Policastros (father and son) and Mike Fitzgerald.